To place an order by phone or fax, simply have your billing and shipping address available, as well as your purchase order number. If you will be paying by American Express, Visa, MasterCard or Discover, no purchase order number is necessary. You will only need to supply us with your credit card number and corresponding expiration date. Once your order is placed we will ship it to you within 24 hours. That is all that is necessary. 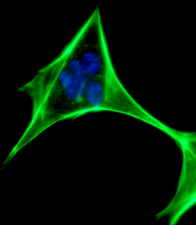 Human fibroblast cell under microscope stained against DNA(blue) and Actin (green). Magnification x700. I’ve been at the lab here for 4 years, and in that time, I have found Citifluor to be easy to deal with, the deliveries are always prompt and most importantly, the AF1 product has been very reliable.